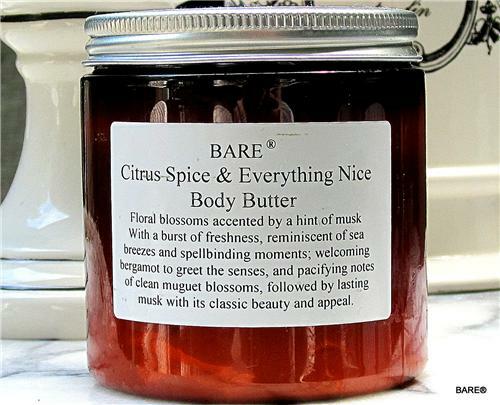 BARE "Citrus Spice and Everything Nice"* Body Butter is a unique blend of soft, floral blossoms accented by a hint of light musk. The all-enveloping fragrance is delightfully scented and creates a burst of freshness that is reminiscent of soft sea breezes and spellbinding moments; welcoming bergamot to greet the senses, with pacifying notes of irresistibly soft, clean muguet blossoms, followed by lasting musk with its classic beauty and appeal. BARE "Citrus Spice and Everything Nice" Body Butter is a traditional beeswax and borax body butter with origins dating BACK 100 Years. Over 98% natural, highly emollient and having over 50% oil content. Historically, this was called night cream or waterless cream in Eastern Europe. Thick, long lasting and capable of moisturizing the driest skin; typically being feet, elbows and knees.